The family of Clarkson in CLARKSON America dates from January 29, 1691, when Matthew Clarkson arrived in New York City from England. Respected in the other country centuries ago, so has it continued to be here. It has given its share of patriots of prominence in the olden times and statesmen of standing after this government was formed. When heads of the best families in New York were in the main merchants, members of this family so engaged were men of integrity and, moreover, with their wealth, worked to benefit the worthy by activity on philanthropic and educational boards. The Clarkson arms, as borne by those of the name in America are: Argent, on a bend engrailed sable three annulets or; the crest, a griffin’s head couped between two wings proper. (I)The line of descent takes one to Robert Clarkson, grandfather of the progenitor, and the reliable record found regarding him is that of his marriage to Agnes Lily, on September 9, 1610. Of the parish church of St. Peter, at Bradford, Yorkshire, England, he became warden in 1615, and it is at this place the name of Clarkson may be traced for five hundred years further back. From what is learned from the various entries upon registers, etc., one is able to state with conviction most positive that they possessed social standing, wealth, influence and excellent rank among families of their district in England. Through the total destruction of the old family home in Whitehall street in the New York conflagration of 1776, the most valuable early records were wiped out, so that what is known now is due to diligent research by members of the family. Robert Clarkson served with the vicar as trustee for the sale of the Manor of Bradford some years after becoming the warden, yet he was a Puritan by inclination. At Bradford, he possessed a large estate, also at Idle, at Pudsey and at Manningham. He died March io, 1632, and was buried at St. Peter’s, which was a special privilege. He married (for his second wife), October 4, 1629, Hester, widow of Ezekiel Tailer, recorded as “per licentia,” which was peculiar, and seldom so unless among the highest gentry. His children were by his first wife. Children: 1. Rev. William, became vicar of Adel, near Leeds, and held the “Lordship of Idle,” marrying Mary Clarkson. 2. Mary. 3. Robert, removed to London, where he became alderman and amassed a fortune equal to $200,000, marrying Hannah Taylor. 4. Rev. David, see forward. 5. Hester. (II) Rev. David Clarkson, son of Robert Clarkson, was baptized at Bradford, England, March 3, 1622; was admitted to Trinity College, Cambridge University, in 1641; was captured by Royalists in 1642, and after being confined ten months was released in time to take his degree. In 1645 he was appointed to a fellowship at Clare Hall, Cambridge, continuing for six years, when he served as minister at Crayford in Kent; then at Mortlake, in Surrey; but was rejected in 1662, by the terms of the Act of Uniformity. He engaged in a series of religious controversies, championing the cause of non-conformity vigorishly with his pen. He was a colleague of Dr. John Owen, in 1682, as pastor of an independent London church, succeeding the latter when he died. Reviews of his life speak of him as “a divine of extraordinary worth for solid judgment, healing, moderate principles, acquaintance with the fathers, great ministerial abilities and a godly, upright life.” His discourses were published in 1696. He died in the parish of St. Dunstan, Stepney, June 14, 1686. Rev. David Clarkson married (first) in 1651, the daughter of Sir Henry Holcroft, Knight, of East Ham, Essex. He married (second) Elizabeth, widow of Wolrave Lodwick, daughter of Matthew Kenrick, of London, a Welsh family, claiming descent from David Kenrick, standard-bearer to the Black Prince, of Edward III.’s time. Children: Lettice; Matthew, see forward; Rebecca; David, married Lady Sands, widow of Sir William Sands; Gertrude; Robert; Katharine. (lll) Matthew Clarkson, son of Rev. David Clarkson, was born in England, died in New York City, July 20, 1702. He was a nonconformist, as his father had been, and with his half-brother, Charles Lodwick, came to New York about 1685. The latter was a prosperous merchant here, and became mayor of the city. Matthew Clarkson returned to England after the revolution which placed William and Mary on the throne, and he petitioned to be made secretary of the Colony of New York, one of those signing this petition being the famous author, Daniel Defoe. He was finally appointed, and sailed with the newly-chosen governor, Colonel Henry Sloughter, on December 1, 1690. When he arrived here, several months later, he found that the government was in much confusion owing to the acts of Jacob Leisler, consequently he became engaged at once in an acrimonious struggle to obtain and maintain position, which resulted in holding office nominally while denied the emoluments. It was an unpleasant predicament, especially to hold such position with any degree of dignity, and yet he succeeded in winning great respect, for he did not rely upon office for standing. Matthew Clarkson married, January 19, 1692, Catherine Van Schaick. She was the daughter of Hon. Goozen Gerritse Van Schaick, one of the earliest settlers of Beverwyck, or Albany, New York, who was prominent. Children: 1. Elizabeth, died in infancy. 2. David, see forward. 3. Levinus, born in New York City; removed to Holland, where he died unmarried. 4. Matthew, baptized April 9, 1699, died 1739; married, June 1, 1718, Cornelia de Peyster, and had ten children, one of whom, Matthew, became mayor of Philadelphia and was delegate to constitutional convention. 5. Anna. (IV) David (2) Clarkson, son of Matthew and’Catherine (Van Schaick) Clarkson, was born in New York City, January 19, 1694, baptized in the old Dutch church in Garden street, August 19,1694, died in New York City, April 7, 1751. Before he was eight years old both parents had died, consequently he went to live with a maiden aunt, Margrieta Van Schaick, and it is believed that he was subsequently sent to his relatives in England for rearing and to be better educated, for he engaged in mercantile pursuits there in 1718, when twenty-four years old. He came back to New York, and at first acquired an interest in ocean-going vessels; then becoming successful as a merchant; was an owner of several, carrying on an export trade. He was a representative to the provincial assembly from 1739 to 1751, with the exception of an interval of a year and a half, and was a patriotic citizen whenever encroachments of the crown aroused the people. David Clarkson married, New York City, January 25, 1724, Ann Margaret Freeman, daughter of Rev. Bernardus and Margrieta (Van Schaick) Freeman, the latter being his mother’s sister, his aunt. Children: 1. Freeman, died unmarried. 2. David, see forward. 3. Matthew, born March 12, 1733, died September 25, 1772; married, June 1, 1758, Elizabeth de Peyster; by whom: David M., married Mary Van Horne, and Matthew, married Belinda Smith. 4. Levinus, died in infancy. 5. Levinus, born October 8, 1740, died May 24, 1798; married, February 21, 1763, Mary Van Horne, whose two children, Charles and Henriette left issue, the former marrying Elizabeth, daughter of John Vanderbilt, and the latter marrying Freeman Clarkson, her cousin. (V) David (3) Clarkson, son of David (2) and Ann Margaret (Freeman) Clarkson, was born in New York City, June 3, 1726, died at Flatbush, New York, November 14, 1782. He was given his early education in Europe, and continued to reside abroad until he was twenty-three years old. When he returned to America he engaged in business and had a large trade with many foreign countries. He built a home on Whitehall street, employing therefor Andrew Gaurtier, who subsequently constructed St. Paul’s Chapel. In those days lotteries were popular, often conducted by the states, especially when raising funds for educational and philanthropic work, and in 1754 he was the winner of one-half of the capital prize in the lottery for founding the British Museum, which yielded him the handsome sum of $25,000. He added underwriting to his business and became one of the wealthy citizens. When his brother, Matthew, who lived at Flatbush, died, he purchased the homestead and used it as his country seat. In April, 1775, he participated in the meeting of Kings county which chose delegates to a provincial convention. He was a member of the New York committee of one hundred and a delegate from New York City to the provincial convention, in which body he figured prominently. He was one of three citizens who offered to guarantee advances of money made to the colony for emergent purposes, the amount being $7,500. The command of a regiment was extended to him in 1775, but he declined. When the great fight took place on Long Island, in 1776, his house was rifled by the British, and his city home was entirely destroyed by fire, September 21, 1776, at which time the family lost its handsome furnishings and valuable records. Accordingly he removed to New Brunswick, New Jersey, but later returned to Flatbush. He was a member of the first board of governors of King’s College, 1754; was an original governor of the New York Hospital, 1770, and both vestryman and warden of Trinity parish, in fact a valued resident of the community. David Clarkson married, New York City, May 3, 1749, Elizabeth, daughter of Philip and Susanna (Brockholles) French, granddaughter of Governor Anthony Brockholles. Philip French was the son of Philip and Anne (Philipse) French, the latter being the daughter of Frederick Philipse. Children: 1. David, born in New York City, November 15, 1751, died June 27, 1825. 2. Freeman, born February 23, 1756, died November 14, 1810; married Henrietta Clarkson; by whom: William Kemble, married Elizabeth Van Tuyl; Charles, married Elizabeth Lawrence; Freeman, married Catherine Balch; Elizabeth, unmarried. 3. Matthew, see forward. 4. Ann Margaret, born February 3, 1761, died November 2, 1824; married, November 16, 1784, Garrit Van Home, whose married children were: Mary Elizabeth, married James Peter Van Horne; Mary Joanna, married Adam Norrie, of Scotland. ?. Thomas Streatfeild, born April 5, 1763, died June 8, 1844; married, October 30, 1790, Elizabeth Van Horne; he was a partner of his two brothers, conducting a large foreign trade at the northwest corner of Stone and Mill streets in New York, owning a number of vessels; their married children were: David Augustus, married Margaret Livingston; Elizabeth Streatfeild, married David Clarkson; Thomas Streatfeild, married Elizabeth Clarkson; Frances Selina, married Augustus Levinus Clarkson; Ann Augusta, married Clermont Livingston, and the unmarried children were: Frederica Cortlandt, Anna Maria, Frederica, Emily Vallete, Ann Margaret and Mary Matilda. 6. Levinus, bor n March 31. 1765, died September 28, 1845; married, February 25, 1797, Ann Mary Van Horne, and their married children were: Augustus Levinus, married (first) Frances Selina Clarkson, married (second) Emily C. McVickar; David L., married Margaret De Longy; Elizabeth, married Thomas Streatfeild Clarkson; Levinus, married Mary Livingston. (VI) General Matthew (2) Clarkson, son of David (3) and Elizabeth (French) Clarkson, was born at his parents’ home on Whitehall street in New York City, October 17, 1758, died there, April 1825, and was buried at Flatbush, Long Island. He was receiving what was considered the best education of his day when the revolution broke out, and in 1775, before he was eighteen years of age, he enlisted as a private in a corps of American fusileers under command of Richard Ritzema. In February, 1776, he applied for appointment in one of the battalions being raised in New York, the former command not having been called upon to do active service, and on failing to be so appointed he joined a volunteer company which was commanded by his brother, David, and forming a part of the regiment of Colonel Josiah Smith. While in this command, he participated in the famous battle of Long Island, August 27, 1776, and was in the retreat of General Washington’s army when it was obliged to move westward and cross the river into New York City. He was appointed aide-de-camp on the staff of General Benedict Arnold, with the rank of major, July, 1777, on the recommendation of General Nathaniel Greene, and immediately filled the post. This took him into the division of General Philip Schuyler, who was expecting the advance of the large British army under General Burgoyne, who was advancing from Canada, and taking the water route had proceeded as far as Fort Ticonderoga, on Lake Champlain, with little hindrance. He was wounded in an encounter at Fort Edward, New York, while endeavoring to rally a detachment which had been put to flight by the Indian allies of the British, but nevertheless he continued in active service until on October 17, 1777, Burgoyne surrendered at old Saratoga, or Schuylerville, this date peculiarly being the nineteenth birthday of General Clarkson, then major. When the famous American artist, John Trumbull, about a century ago, painted the picture of this great event in this country’s history on the walls of the rotunda at Washington, he included Major Clarkson’s portrait in the group of officers. He was wounded another time. It was during the battle of Stillwater, to the north of Albany, when struck in the neck with a ball while he was carrying an order of his general to the commanding officer of the left wing. During the time General Arnold was in Philadelphia, Major Clarkson continued as his aide, and it was a little later, or in 1778, that he became engaged in a very bitter controversy with Thomas Paine through the medium of the newspaper. Paine was secretary for foreign affairs, and by reason of the heated argument was led into the act of giving government secrets to the public, which resulted in his forced resignation from the high political office. 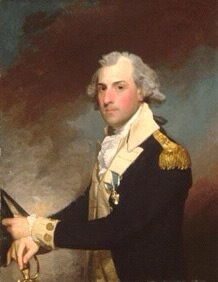 Major Clarkson was summoned to testify at the time of the proceedings of the civil authorities against General Arnold by the state of Pennsylvania, by reason of the latter’s conduct in the Philadelphia command. Major Clarkson refused to testify on the ground that a military officer was not subject to their jurisdiction. Congress took up the matter, with the result that he was reprimanded; but at the same time congress granted his application for permission to join the southern division of the army. Bearing a letter from Hon. John Jay, which spoke in unstinted praise of his ability, in the summer of 1779, Major Clarkson presented himself to General Benjamin Lincoln, of South Carolina, and was immediately attached to his staff. While in this position, he distinguished himself in an assault made on Savannah, Georgia, in the fall of that year, and he was the one to bear despatches to General Washington and congress which announced the unpleasant news of the enterprise’s failure. He was one of the staff officers who voted against the capitulation of Charleston. When that city surrendered, May 12, 1780, he was made a prisoner, but although paroled later on, he was not exchanged until late in the war. He was a determined patriot, for so soon as he was at liberty he cast his lot with a French naval expedition, sailing from Newport, which took sharp action with British vessels off the Virginia capes. He joined General Lincoln again as aide-de-camp in February, 1781, and took active part in all the large operations at the end of the war, being present at the surrender of Yorktown. Under Secretary of War Lincoln, he was made assistant. Congress granted him permission to engage in the French service in the West Indies, but through lack of warfare of any note he did not go there. He was commissioned brevet-lieutenant-colonel on November 1, 1783, and when peace was declared, retired. His valiant service put him in the position to become one of the early and most worthy members of the Society of the Cincinnati. General Clarkson was chosen regent of the State University of New York, in 1784, and in the interest of that institution visited Europe. On his return to this country he married, and presently engaged in business, in connection with John Vanderbilt. He was appointed brigadier-general of the militia of Kings and Queens counties, in June, 1786. Among those concerned in the rebuilding of Trinity Church, he was one of the most prominent, and was made a vestryman. In political life he served as member of assembly, 1789-90, and had the honor of introducing a bill providing for the gradual abolition of slavery in New York. For a period, he was United States marshal for the New York district, served as state senator, 1794-95, and for a long time was commissioner of United States loans. No person appeared to me more entirely exempted from the baneful influence of narrow and selfish considerations, or who pursued more steadily and successfully the vivid lights of Christian philanthropy. He was eminently distinguished in the whole course of his life for benevolence of temper, for purity of principle, for an active and zealous discharge of duty, for simplicity of manner, for unpretending modesty of deportment, and for integrity of heart. It was his business and delight to afford consolation to the distressed, to relieve the wants of the needy, to instruct the ignorant, to reclaim the viscious, to visit the fatherless and widow in their affliction, and to keep himself unspotted from the world. Such a portrait is not to be drawn from all the records of heathen antiquity. It presents an elevation of moral grandeur “above all Greek, above all Roman fame.” It belongs to Christianity alone to form and to animate such a character. General Matthew Clarkson married (first) May 24, 1785, Mary, daughter of Walter and Catherine (Alexander) Rutherfurd. He was the son of Sir John Rutherfurd, of Edgerston, Scotland, the younger brother of Hon. Robert, Baron Rutherfurd, and Catherine Alexander was the daughter of James Alexander, celebrated as a colonial lawyer, and sister of Major-General William Alexander, titular Lord Stirling, of revolutionary fame. Mrs. Clarkson died July 2, 1786. General Clarkson married (second) February 14, 1792, Sally, daughter of Samuel and Susan (Mabson) Cornell. Samuel Cornell was a descendant of Richard Cornell, an early settler on Long Island and the owner of much property in North Carolina, but who lost it by confiscation, being a Tory. By the first marriage he had a single child, and six by the latter marriage. Children: 1. Mary Rutherfurd, born July 2, 1786, died December 24, 1838; married, July 29, 1807, Peter Augustus Jay, eldest son of Chief Justice John Jay and his wife, Sarah Van Brugh (Livingston) Jay. (VII) David (4) Clarkson, son of General Matthew (2) and Sarah (Cornell) Clarkson, was born March 27, 1795, died June 3, 1867. He was a man who added distinction in more modern times to a family name already famous, leaving a reputation which has brought the family in every branch to be respected in the metropolis. While he lived.no one in the city held more honored reputation. In more than one way did he gain this prominence, even had he not been the son of an honored father. He was president of the New York Stock Exchange for many years, and a memorial in citing the many admirable qualities of his character says of him: “By the amenity of his manners, his high sense of honor, and his great executive ability, he won the personal respect and deference of its members.” After holding this position of eminence in the financial world, he was chosen president of the Gallatin Fire Insurance Company, and acted as such almost to the time of his death. He took a natural and great interest in a number of New York’s most worthy charities. In this respect he did not require urging, but was the one to draw others into co-operation, and in this field was appreciated by many boards of benevolent institutions. He was a long time a governor of the New York Hospital, following in this in the footsteps of father and grandfather, so that for one complete century, from 1770, when the board organized, to 1870, the name was on the board. David Clarkson married, March 27, 1822, Elizabeth Streatfeild Clarkson (his cousin), who died February 11, 1886, child of Thomas Streatfeild and Elizabeth (Van Horne) Clarkson. Children: 1. Matthew, see forward. 2. Thomas Streatfeild, born December 16, 1824, died September 15, 1902, in New York City; married, December 16, 1852, Ann Mary Clarkson, daughter of Thomas Streatfeild and Elizabeth (Clarkson) Clarkson, who died in New York City, April 7, 1895 ; by whom: Annie and Emily Vallete, the latter marrying, July 31, 1901, William A. Moore. This entry was posted in Du Bois history on December 6, 2016 by jsdubois28.